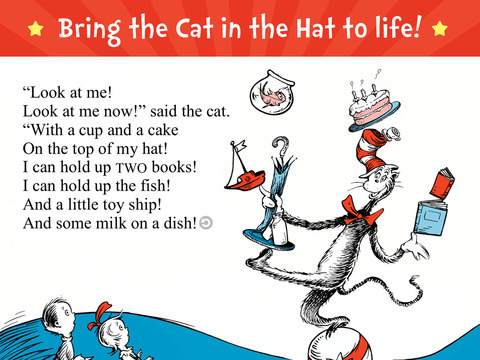 The Cat in the Hat - Read & Learn is a new app from the talented team at Oceanhouse Media. Launched in 2009, this developer has produced hundreds of high-quality apps for young readers, including all of the titles from Dr. Seuss. Their new version of The Cat in The Hat will not disappoint, but what is different in this title? How has "Read & Learn" improved or changed the digital reading experience? If you have seen earlier Dr. Seuss book apps, you'll know that most of the titles have little or no animation and limited interactivity. These well-constructed apps are a staple of digital reading and valuable still, but the new "Read & Learn" version takes advantage of the touch-tablet medium even more, meeting the expectations of a new digital generation of kids and their parents. This app includes much more animation than earlier Seuss apps, alongside interactive features that include learning activities. These additions let youngsters match the content of the story for reading comprehension. There are also "sound starters" (emphasizing first letters in words), "who's who" (matching characters), "rhyme time" (matching rhyming words by sound), "super speller" (word formation), "choose me" (story content), "what's what" (story content) and much more! These interactive enhancements make this new Cat in the Hat an excellent classroom or learning app for any setting, especially for learner readers. For instance, on the first page the reader is invited to choose an item they would bring outside on a 'cold, cold, wet day' like the one in the story. Choices include a book and a cake (wrong answers) in addition to a hat or umbrella (right answers). These activities do break into the reading experience but are available with a little star icon so can also be skipped. This title has all the great features parents, librarians and teachers have come to love about Oceanhouse Media apps, like quality narration, highlighting, sound settings and easy navigation via a pageguide. Links for adults (including web and social media) are neatly tucked into a parent section that requires fluent reading to access. Overall, this is an exceptional new addition to the children's app market, featuring solid educational enhancements, thoughtful interactivity and well-produced effects. No digital library for kids should go without The Cat in the Hat, and this version is among the very best! 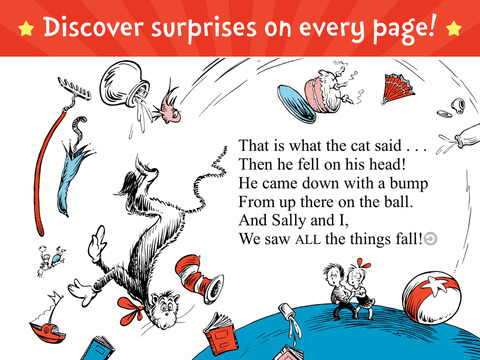 Experience the wonderful world of Dr. Seuss like never before with The Cat in the Hat - Read & Learn! This deluxe digital book app brings The Cat in the Hat to life with delightful animations and Learning Activities that help reinforce key literacy skills!